Nashvillians usually have plenty to do for Hispanic Heritage Month. 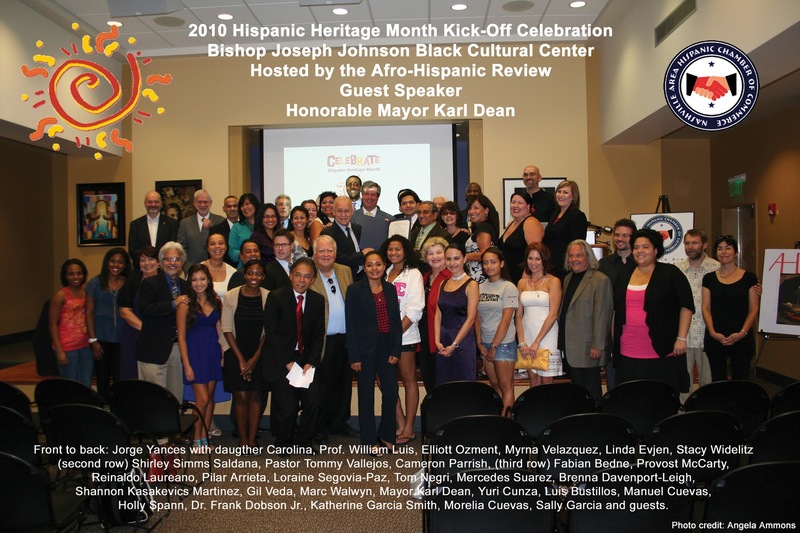 To help you find specific events, the Nashville Convention & Visitors Bureau has posted a 2010 Hispanic Heritage Month Calendar, which includes most of the headline parties and such around town, so check that out, and you should be set. (Also, if you haven't noticed the Conexion Americas banner at the top of this page, click there, and you'll see all the events Conexion Americas has scheduled, including next Friday's "Fiesta" at the Cannery). The THNCC will be hosting a Hispanic Heritage Month Networking Lunch from 11:15 a.m. to 1:00 p.m. at Chappy's Restaurant on 1721 Church Street. The MTNHD will be hosting a "Somos TN" (We Are TN) fundraiser 6:00 p.m. to 8:00 p.m. at Loews Vanderbilt Hotel at 2100 West End. Ave., with expected attendees including Nashville Mayor Karl Dean, Montgomery County Commissioner Tommy Vallejos, TN Democratic Party Vice-Chair Elisa Parker, and TN House of Representatives District 56 candidate Matt Kenigson. 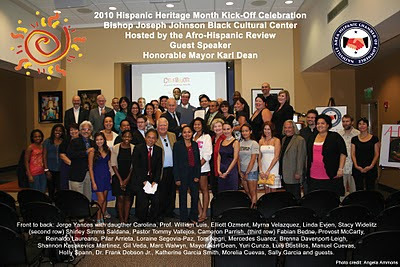 If you know of a Hispanic Heritage Month event in Middle Tennessee that isn't mentioned above, please leave the event info in the comments. Tonight at Sarratt: free, live performance of "200 Years of Mexican Independence"
This is a theatrical performance to celebrate 200 years of Mexican Independence, which is being organized by Destellos Culturales and co-sponsored by Center for Latin American Studies. Please note that the performance will begin at 6pm, a correction from time sent out on this week’s weekly email. This event is free and open to the public. 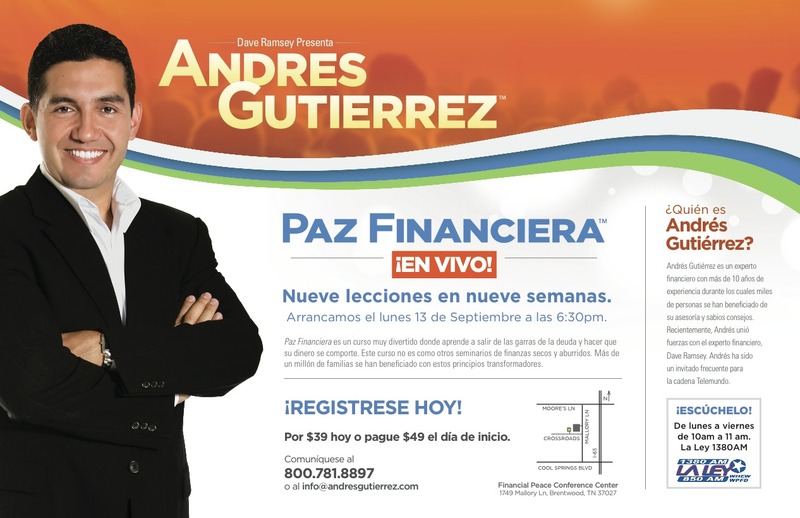 Andres Gutierrez, the Spanish-language face of the Dave Ramsey product Financial Peace, sent me the above announcement about his next local live class (in Spanish) starting this month. I'm not sure whether it starts today, September 13, as the announcement indicates, or next Monday, September 20, as Andres stated in his e-mail to me. You may want to call or e-mail to find out. I'll update this post tonight if I find out. In any case, the class will be on Monday nights from 6:30 to 8:30. The cost per family is $39.00. This Sunday, September 12, 2010, is the 150th anniversary of the death of Nashville man William Walker at the hands of a Honduran army firing squad. 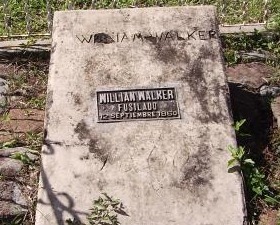 You remember William Walker - he is the Nashvillian who the New York Times pretty much called the most famous man in the world, who was the "King" of the filibuster as the filibuster was originally known, who became president of Nicaragua but never reached his 40th birthday, and whose defeat is still celebrated today with a national holiday in Costa Rica. Read the Wikipedia article on William Walker here. View a photo tour of the last days of William Walker here. 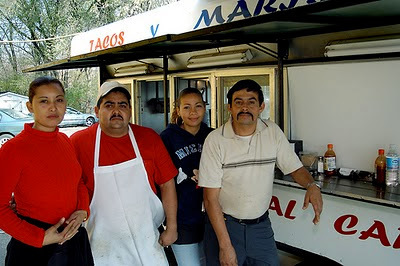 For all of the articles about William Walker that have been posted on HispanicNashville.com, conveniently located on a single page, click here. The above video, entitled "See," debuted in 2008 to at least two immediate imitations (how flattering) - one by Aunt B., and one by Mack. Interestingly enough, I don't think I ever posted the video here at HispanicNashville.com. So now, two years later, here is See. P.S. : I've created a few other ads besides this one; to see all of the ads together on one page, click here. “Immigration in a Time of Economic Crisis: Downturns and Returns in US/Mexico Relations”; featuring CLAS Visiting Resource Professor Jorge Durand; Conexión Américas and the Mexico Institute Woodrow Wilson Center; 5pm reception; 6pm roundtable; First Amendment Center, 1207 18th Avenue. Visiting Resource Professor Graduate Workshop: Jorge Durand, professor of anthropology at the University of Guadalajara, Co-Director of the Mexican Migration and Latin American Migration Projects, and visiting resource professor at CLAS, will present a paper in Katharine Donato’s new migration seminar that discusses shifts in outmigration from Latin America. Open to graduate students and faculty. Lunch will be provided. RSVP by Tuesday 9/7 to Norma Antillón at 2-2527; 12pm; 123 Buttrick Hall. “200 Años de Independencia de México- 200 Years of Mexican Independence”; Play by Destellos Culturales; 6:30pm; Sarratt Cinema. CLAS Teacher Workshop: “What Moves Them: Immigration and the Push Factor”; 9am-3pm; Vanderbilt campus. Click here for more info on registration. Lecture by Leonard Folgarait “Images and Imaginings of the Mexican Revolution: 100 Years and Counting”; 4pm; 134 Featheringill Hall. (see attached flyer, feel free to distribute). 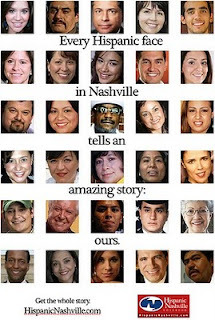 CLAS Storytelling with the Nashville Public Library on Mexican Independence; 11:30am; Nashville Public Library; 615 Church Street. 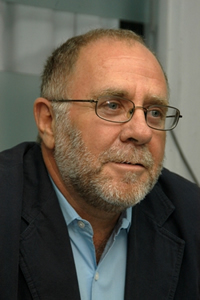 Jorge Durand, professor of Social Anthropology at the University of Guadalajara, is in residence at CLASuntil mid-September. 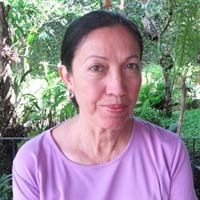 Durand is co-founder of the Mexican Migration Project, a bi-national research effort with the aim of furthering understanding the complex process of Mexican migration to the US. Read more about this project here. While on campus Dr. Durand will teach a seminar with Dr. Katharine Donato (Sociology), and be featured at the Tuesday, September 7 roundtable on immigration (see above for details). Dr. Durand will also lead a K-12 Teacher Workshop as part of the CLAS Outreach program. As part of the CLAS Liberation Theology series, Elsa Tamez will be on campus Oct.3-9. Tamez is a native of Mexico who has resided for many years in Costa Rica. She is a major voice in biblical criticism in general and feminist criticism in particular, and author of Bible of the Opressed. Tamez will participate in a roundtable on Monday, October 4 “Understanding Liberation: Theology, Poverty, and Education”; 4pm; School of Divinity Reading Room, with reception to follow at Tillett Lounge. Sometimes even the best of us turn into hacks and armchair pundits when the conversation turns to a political hot potato. When real, provable facts are not part of our day-to-day learning, we arm ourselves instead with seemingly logical arguments leveraged on a single news item, anecdote, or rumor. 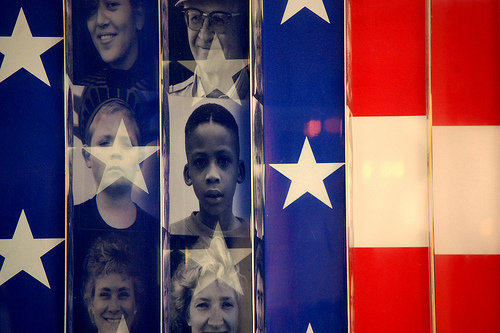 However presented, narratives about immigrants and their effects are likely to be constructed with few facts and little empirical research. One of the reasons that various parties to the immigration debate can get away with repeated exaggerations and sometimes outright confabulations is the absence of objective data to gainsay any assertion they might make, however wild. In the absence of valid, reliable, and relevant data, one can make almost any claim about the causes, characteristics, and consequences of immigration, find anecdotal evidence of seeming verisimilitude to support it, and then proceed as if the claim were true without fear of falsification. Next Tuesday, September 7, Mr. Durand will lead a panel of experts appearing in a roundtable at the prestigious First Amendment Center. 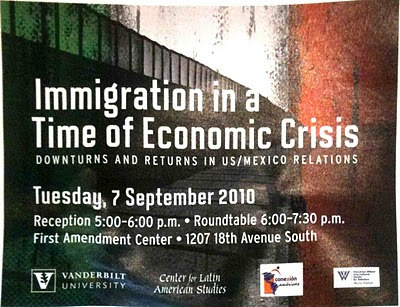 The fact- and research-centered forum on economics and immigration is entitled, "Immigration in the Time of Economic Crisis: Downturns and Returns in US/Mexico Relations." Conexión Américas is proud to partner with The Center for Latin American Studies at Vanderbilt, along with The Wilson Center, to host a roundtable discussion on the effects of the recent economic downturn on Mexican immigration to the United States. The panel will bring together leading experts to analyze the interrelation of immigration, economic crisis, and increased border security- and what this means for Mexico as well as the US. Featured will be Jorge Durand, who is a leading expert on Mexican immigration issues. He is also a CLAS Visiting Resource Professor and the author of “Crossing the Border: Research from the Mexican Migration Project”. Panelists include Vanderbilt faculty Katharine Donato (Sociology) and Gary Gerstle (History) as well as David R. Ayón (Wilson Institute) and Conexion's executive director, Renata Soto. Click here for more information on Jorge Durand's research and publications. The event is free and open to the public and will begin at 5pm with a reception, with the roundtable to follow at 6pm. There is a Facebook page for the event here. CLAS also has its own announcement here. 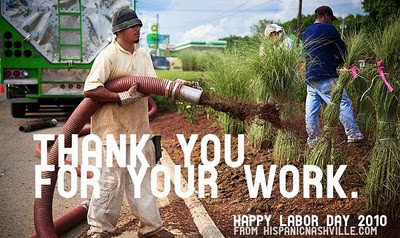 Notice anything different about the URL and uppermost part of the HispanicNashville.com homepage today? Hint: it's not so much what's been added, but what's been removed.